Tune in to live coverage and highlights of Louis Vuitton America's Cup World Series racing from Bermuda this weekend. Expanded broadcasts through television, online and mobile devices will bring racing to the world. “We are looking forward to an exciting weekend of racing, and through multiple broadcast platforms, viewers around the world will get a first look at Bermuda’s Great Sound and the venue for the next America’s Cup,” said Harvey Schiller, Commercial Commissioner of the 35th America’s Cup. On television, NBC Sports will broadcast Sunday’s races in the U.S. at 2 pm ET / 1 pm CT on television and simultaneously online through NBC Sports Live Extra. Viewers can also watch live racing and replays from both days on the official America’s Cup App. In the UK and Ireland, both days of racing will air live on BT1 Sport – at 17:00 on Saturday, 17 October and 17:30 on Sunday, Oct. 18. BT1 and BT2 Sport will run replays of racing throughout the week (check local listings). Highlight shows from the weekend will run on the BBC on Monday, Oct. 18 at 8:00 pm and Tuesday, Oct. 20 at 5:35 pm and 10:30 pm. In Bermuda, racing is live on ZFB and via AC+ on the America's Cup App. Watch this space for more news on Bermuda options. Around the world, the Official America’s Cup App will keep this weekend’s racing at fans’ fingertips. Live streaming of all races will be available on mobile devices through the AC+ service within the app. AC+ exclusive coverage features live racing broadcasts, onboard camera views, video extras, replays and behind-the-scenes stories. Live coverage on AC+ is subject to territorial broadcast restrictions. The Official America’s Cup App is available for Android and iOS devices via Google Play and the Apple iTunes store. The app is free to download and includes highlights, news, results and Virtual Eye race coverage. 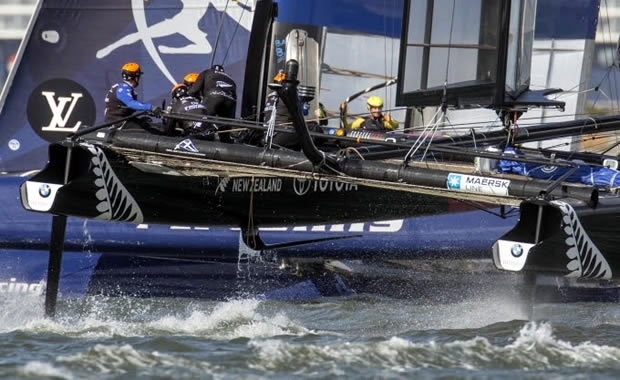 AC+ is a paid service (US$7.99 for the Louis Vuitton America's Cup World Series Bermuda) for live streaming video (subject to territorial restrictions) and enhanced features. Complete broadcast replays of the first two Louis Vuitton America's Cup World Series events this year – Portsmouth and Gothenburg – are now available at a discounted rate through the America’s Cup app (territorial restrictions apply). Exclusive AC+ video features for both regattas are now 99 cents US. Second screen experience only (no live racing) on AC+ via the America’s Cup app and www.americascup.com.